John Anderson is on the project leadership team for MILES, representing the University of Idaho. He is also the visualization/virtualization component lead for the project. 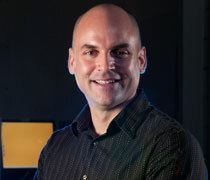 John Anderson is an assistant professor in the College of Art and Architecture, co-founder of the Virtual Technology & Design program and Co-Director of the Virtual Technology Laboratory at the University of Idaho. His teaching and research are focused in the areas of trans-architectures, tele-present environments, evolutionary game theory and design visualization technologies with an emphasis on complex system design and analysis. He is a design thinker who leads interdisciplinary communities of virtual design experts, scientists, engineers, educators, and artists where the focus is the incorporation of virtual technology in all aspects of education, research, modeling, and simulation.